Whole-brain coordination for relaxation, stress relief, creativity, and problem solving. Music touches our hearts and resonates within our bodies. The right music can truly renew us, helping us to feel relaxed and rejuvenated. Great musicians have always recognized this therapeutic power of music, and researchers are finally proving them right. The Sound Medicine Series features the works of inspired musical pioneers who are exploring music’s healing power. By combining soothing music with sophisticated sound technology, Music for Brainwave Massage has been shown to effect profound changes in brainwave patterns and states of consciousness—changes discernable on brain-mapping EEG equipment. 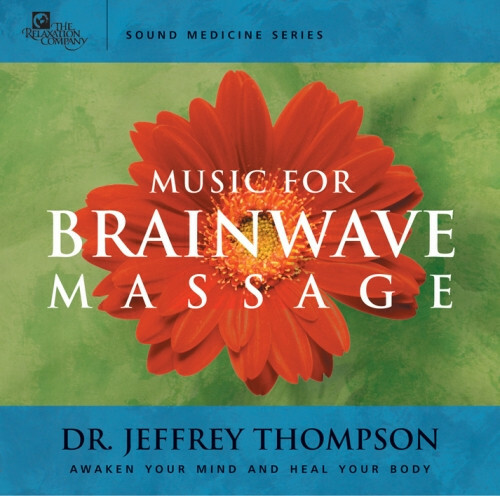 Throughout the flowing, peaceful melodies, Dr. Thompson has incorporated specific audio signals to create a sympathetic response in the two hemispheres of the brain. This coordination of right and left brains is associated with deep relaxation, stress reduction, creativity, insight, and enhanced problem-solving. Dr. Jeffrey Thompson has been researching the effects of sound frequencies and music on the mind and body since 1981. He has produced over 50 CDs and audio tapes, which are currently being used by health practitioners as well as the general public in 26 countries. He teaches PhD courses in Behavioral Psychoacoustics and Clinical Sound Therapy, and he also has a private sound-therapy practice at the Center for Neuroacoustic Research in Encinitas, California. suggestive words/ideas on a second silent track, e.g. I really like this CD. I use it as background music to tune out thought breaking voices at my job (i.e. science/legal). It is unobtrusive, calming, and rich sounding.